Price: $129.99 $99.99 On Sale! This bridle is gorgeous!!! 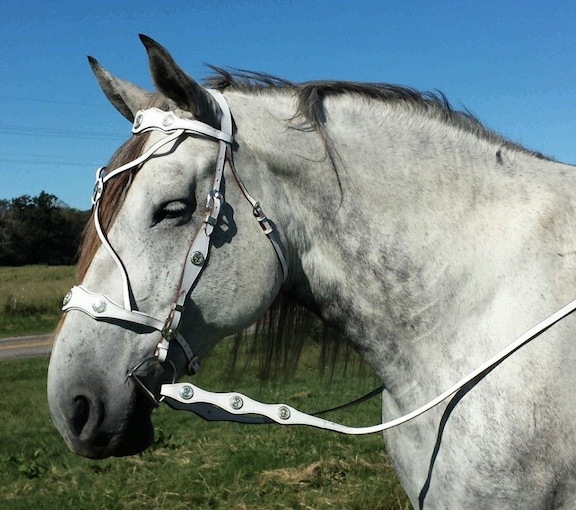 This white leather bridle with chestnut edges has silver hardware and conchos. It was designed just for us. It comes with white reins with chestnut edges. It has 3 silver conchoes at the bit end of split reins. The browband and noseband are padded. See the matching White Draft Breastcollar below.